In my early sermons at MEUMC, I tried to outline what I think are the most important characteristics of genuine Christian community. The first hallmark I named was this: God’s Word ALWAYS wants to become flesh. While the incarnation of God in Jesus Christ is the supreme example of enfleshment, it is not singular, some event in the past. Jesus is ALIVE and still seeks to be incarnate in the Body of Christ … and in you! Reading the scriptures is vital to life in Christ. But at some point, God’s Word wants to read US, to interpret who we really are. We yield and let God’s Word describe our true identity. Our September worship will expand our thinking about this idea. For the five September Sundays, we will embark on an adventure in incarnation together as we expose ourselves to the Word of God as found in the Letter of James and submit to let it shape us as individuals and a church. 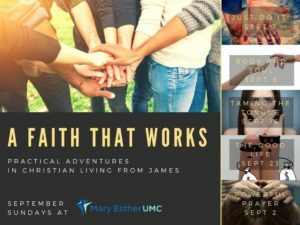 A Faith That Works is the title of the series. You can see the series graphic on this page. Friends, we may not be saved by our works (Thank the Good Lord for that! ), but we are saved FOR works. In other words, if the CROSS of Jesus is an arrow, then the target is the LIFE of Jesus living in us. Works don’t earn our salvation; but our salvation earns a life that is shaped by the Holy Spirit. And it’s such a good life! Don’t forget to register for Wednesday night meals and to volunteer to help in the kitchen at www.divedeepwithme.com. With your help, it’s going to be a fine time! Mark your calendars for Sunday, October 7, 2018, at 3:00 p.m. Bishop David Graves will be hosting a town hall meeting at Navarre UMC. 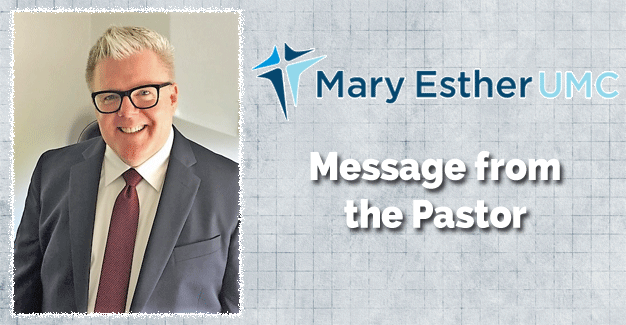 The district town hall meetings are part of an ongoing conversation concerning The Commission on A Way Forward and the called General Conference scheduled for February 2019. The purpose of these gatherings is to bring clarity and answer questions around the three proposed plans coming from The Commission on A Way Forward to the 2019 General Conference. All interested United Methodists, both lay and clergy, are invited to attend!